A Revelation About Iowa High School Baseball…..
It’s the only state in the midwest that plays high school baseball AFTER graduation. And in Iowa they make it work for – get this – the sake of the kids. 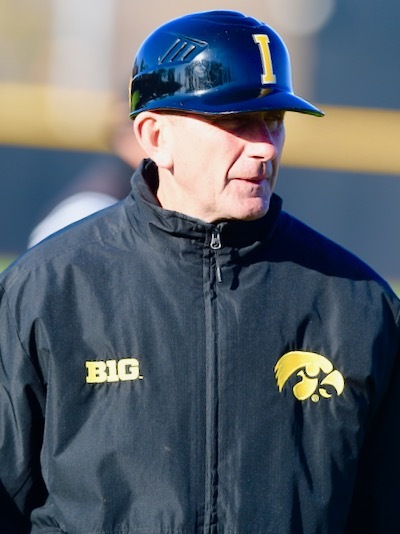 Iowa City – Iowa head coach Rick Heller is probably the best guy around to answer the question from those frustrated with cold, wet spring weather and high school baseball. How does high school baseball in the state of Iowa work? Yesterday (Saturday)…I took my own turn in asking him. In his fifth season as coach of the Hawkeyes, the Eldon, Iowa native is more than aware – and accustomed – to making something work that hasn’t worked previously. He’s turned the Hawkeyes program into a perennial winner and Big Ten tournament qualifier in just four short years. His first baseman in 2017, Jake Adams, led the conference in home runs (29) and was drafted in the sixth round by the Houston Astros. But he also grew up in a culture that largely ignored playing high school baseball because of the horrific spring weather in March and April. As the “feel” temperature approached 28 degrees (with wind chill) prior to Saturday’s double-header with Ohio State…he just smiled. But the weather in Iowa has also made it difficult to establish a culture of amateur baseball. Kids want to play the sport, sure enough, but not with the uncertainties of freezing weather and sub-standard facilities that are impossible to maintain because of that weather. So the answer out here, for years, has been…start in May and play into the summer. And unlike other states (Ohio among them), they make it work. High schools here start in May, they play more games (44), and they charge admission. There’s administrative staff on hand. There’s conflicts, of course, with other activities. But the bottom line is…kids enjoy playing baseball, and playing in better weather. And in Iowa – wink, wink – they do it for the kids. “It’s popular with kids,” says Heller. “I know other states don’t do it because there’s all kinds of reasons. But bottom line, kids who want to play baseball enjoy playing because they play in the summer. Opponents in Ohio will cite that Legion baseball is the answer – or ACME – but those programs have suffered in recent years as a result of money….and ‘travel’ and ‘elite’ teams that glean the best players who have the means to pay for a better, and privileged, baseball experience. Heller shared a surprising revelation about both. “We have Legion baseball in Iowa, but it plays in the spring, just the opposite of other states. And the nice thing about here is that when summer gets here there’s more opportunity for kids to play that can’t afford travel ball. It helps solve that difference between the ‘haves’ and the ‘have nots’. And, it’s good for Heller, and other college coaches, too. So despite the arguments against, it can be done. In Iowa they find a way to pay for it, to work around graduation, vacations, administration, and conflicts with other sports. They readily admit that they’re no different than people in Illinois, Indiana, Michigan, and Ohio. They even admit that there’s people who DON’T like it. But it’s the same weather; and it’s the same issue – to give kids the best opportunity to play. And they do it – wink, wink – because it’s what’s best for those kids.